- Adjustable Trigger: User-adjustable between 3.5 and 5 lbs weight of pull and minimum over-travel. 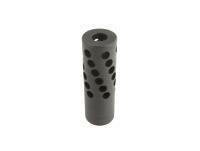 - Threaded Muzzle: Threaded muzzle for use with compatible compensators, muzzle brakes and suppressors. 1/2-28 UNEF for 204, 223 & 22-250 | 5/8-24 UNEF for 243 and larger. - 3-Lug Bolt Design: Simple, rugged design lends itself to years of reliable service and top-notch accuracy and relibility. - 3 Position Safety: Provides visible and tactile feedback as to position of the safety. Provides locked, load/unload and fire positions. - Maximun Scope Clearance: The 60 degree bolt lift provided by the 3-lug bolt design gives the shooter maximum clearance between the bolt handle and a mounted scope - for fast cycling. - Flush Fit Rotary Magazine: The detachable, compact rotary magazine fits flush with the stock for easy carrying and no snags. The low-maintenance polymer magazine provides smooth feeding in a rust-proof, durable package. 5-rnd capacity in standard calibers and 4-rnds in magnum calibers. - Trigger: Adj. 3.5 - 5 lbs. - Length of Pull: 12.5" – 13.5"
" I haven't fired this yet, but the fit and finish are good. It is a well made rifle. My first act was to install a Boyd's thumbhole stock. The other hunters in the family are waiting their turn to try it. "